PhilCon was a bit of a mixed bag this year. We got bupkis. Nothing. Nada. Not a peep from anyone. We all appreciate that conventions are run by volunteers and they can often get overwhelmed with requests, but silence isn’t necessarily the most thoughtful form of communication. As always it was great to mingle with new and returning fans of Finders Keepers, and though I didn’t sell a ton of books, I got to catch up with some of my fellow authors and editors, and even laid the groundwork for a potential Crossline publishing deal. Nothing in stone, but at least conversations are taking place that could result in some exciting news next year. 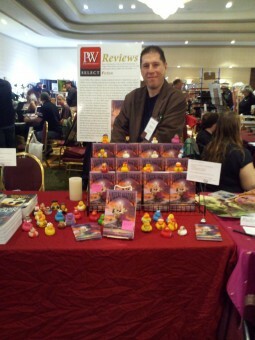 Here’s me at the table, which I shared with fellow author James Chambers, whose own work tends to focus more on horror and the supernatural, including tales about zombies, gouls, fairies and other creatures that go bump in the night. Part of the fun at these shows is just getting our geek on, chatting up our favorite (and least favorite) comic book movies. I’ll mention that the Spiderman franchise come up quite a bit, but I’ll save the rankings for a separate blog entry. I also met up with the editor of Space & Time Magazine, who said that Finders Keepers is next in line for a review. So fingers crossed that they actually like it! PhilCon was actually my last show of the year, so I’ll be taking a breather until spring 2012, when I’ll be back with a number of shows, which I’ll announce once I’ve locked in my appearance. Until then I’ll keep plugging along online and keep you posted on all the news that fit to print.